Most people have a dream car and for some, it’s a brand new Mercedes-Benz. It’s no surprise seeing as it’s one of the most renowned and sought-after brands in the world. In 2017 alone, Benz sold approximately 2.3 million cars worldwide. However, for many, luxury cars can seem as though they’re out of reach because of the cost implications. You may be thinking about getting your first Benz or perhaps you aren’t a new customer and are thinking of upgrading to a new model. Here are a few important things to consider when you happen to buy your next Benz. When you’re thinking about buying a Benz, one of the first things to decide is whether you want to buy a brand new one or a used one. The biggest determining factor in this choice is often which you can afford. There are pros and cons of whatever decision you make, so make sure you weigh them out properly. When buying a used car, you need to first do your research so that you don’t end up realizing later on that you’ve acquired a money pit. Also, check the vehicle history report and do a good inspection of the car to make sure that it’s been well-maintained and there aren’t any hidden faults. You should, however, bear in mind that luxury cars are said to depreciate at a higher rate than economy cars. Depending on the year and model you decide to go for, buying a Benz can be relatively expensive. Before you commit to such an expense, look at your finances and see if you can afford to keep up with the payments. If you’re buying the car outright, make sure you’re not emptying your account and still have some reserves to help cover bills and expenses. In order to determine whether or not you can afford it, you’re likely going to need to take an honest look at your finances. Also, remember that if you’re taking the car out on finance, you need to be sure that the interest isn’t too high so that you aren’t at a loss. If you can’t seem to find a good interest rate, you may need to work on improving your credit first. However, if you’ve done your research and feel you can afford to buy it, on months where unforeseen circumstances arise, there is the option of payday loans online. This should help you cover any areas you’re falling short until you get paid. In order to decide what model you want, it’s ideal to first think about what you want in a car. Have you always dreamt about riding down a major road with your top dropped or is the latest tech more important to you? The good thing is that Benz comes in different shapes and sizes as well as with a range of features. Other things to take into consideration are how often you’ll be driving the car, and whether or not it’s fuel efficient or you’ll be filling up the tank for a relatively high amount. This should help guide you when making a final decision. If, for instance, you have a big family then the Mercedes-Benz V-Class could be a good option. Not only is it spacious but you have a choice of two engines, the seats can be rearranged into whatever form you want, and there’s collision attention assist. 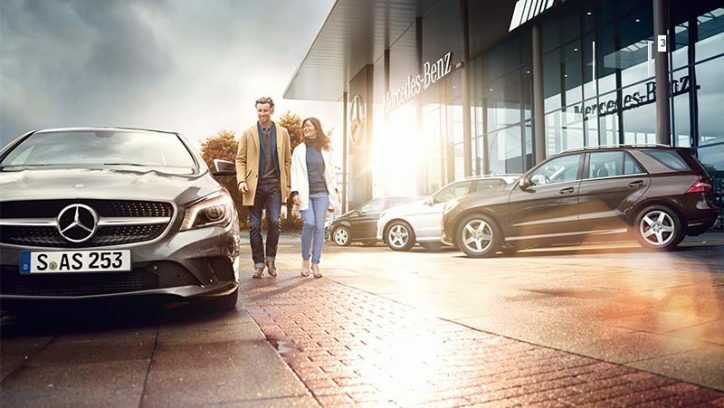 Take your time to look at the official Mercedes-Benz website to see what features every potential car has and which are best suited for your needs. Before you buy a Mercedes Benz, you need to think about who is going to help you maintain the car. You can choose to use a Mercedes Benz dealer or an independent auto repair shop. On the other hand, if you’re the DIY type of person, you could maintain it on your own. If you decide to use an independent auto repair shop, it’s imperative that you make sure they’re competent and capable of helping maintain and fix your car if problems arise. Some mechanics have no experience with certain models, so may not be able to fix it. On the other hand, if you do decide to go with a Benz dealer, look for ones in your area and ensure they’re reliable. Also, take into consideration that the maintenance costs for a used Benz tend to be a lot higher than that of a new one. However, if you plan to maintain it on your own and buy any parts you need online, you should find that it’s far cheaper. Another thing you may want to consider when buying a Benz is the cost of insurance. If you’re a first-time luxury car buyer, you may be startled by the cost of insurance. You can check online for an estimate quote to see what you’ll be getting into before committing. To get affordable insurance, you should see if you can afford to pay one lump sum annually. It’s possible that you’ll find, not adding multiple drivers to your policy and finding ways to limit your annual mileage lowers the cost. Also, compare insurers before committing to one as you may find cheaper rates as well as better packages if you take the time out to look. Before buying any car, you want to think about how long you’re looking to drive it for. This could help you make a final decision taking all of the above things into consideration as well. If you know you want to drive the car for the next five years, then there is a certain standard you should be looking for as well as a level of reliability. Although a Benz is a great car to drive, make sure it’s the right one for you. Buying a new car can bring feelings of euphoria and excitement. Nevertheless, it’s important to know that luxury cars come with responsibilities and need to be well-maintained if you don’t want to spend tons on fixing faults. However, you should find that you’re able to do these things that the smooth ride may be worth the money.